A unique way to add whimsical decoration to your outdoor space. 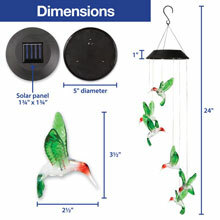 Use the solar powered hummingbird wind chimes anywhere you want to add color and humor. 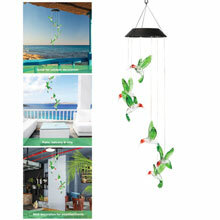 Ideal for the garden, patio, porch or use indoors for added charm to any room. Energy saving and environment friendly, solar panel automatically recharges during day and automatically turns on lights during night. 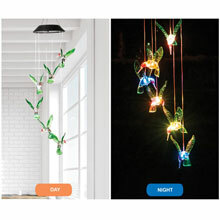 Hummingbirds featuring a color changing LED calmly and softly changing from one color to the next. 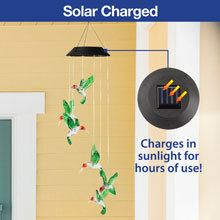 Easy to use and convenient to hang on, no wiring or external electricity required for use. •DECORATIVE DESIGN: Solar hummingbirds adds a charming display of light and whimsy to your porch or yard, making your outdoor settings enjoyable and charming as any room in your home. 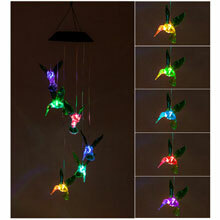 Watch the dangling hummingbirds create a delightful color-changing display at night. •ECO FRIENDLY & ECONOMICAL: Solar powered color changing LED lights adds a decorative touch to your pathway, deck or patio; all while taking advantage of solar energy. The LED bulb remains cool to the touch at all times, providing safe lighting that doesn't burn or heat-up. No wiring required, installation, long-term energy savings and becoming eco-friendly have never been easier. •EASY TO USE: Their installation is easy and best of all there is no maintenance. 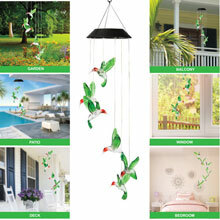 Once you have your solar hummingbird lights set up, switch this unique wind chime to "ON", you can forget about them. The sun will power them indefinitely, then the lights will automatically come on at dusk to provide outdoor lighting exactly where you want it. •SOLAR ENERGY: These hummingbirds gather energy from the sun during the day, make sure the included solar panel faces the sun and gets regular hours of daylight. This will help charge the inbuilt battery. That battery will then provide all the power necessary for the best solar hummingbird lights to work during the hours of darkness. 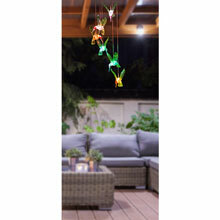 •LED LIGHTS work last up to 6 - 8 hours each time when fully charged. 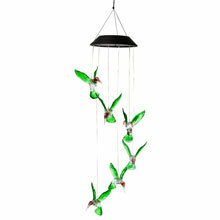 Durable plastic and acrylic hummingbirds are fade resistant, and durable for all types of weather.